Wedding planning is stressful! A lot more for a bride as she’s been day-dreaming about having the perfect fairytale wedding ever since she’s been watching the whimsical stories of Disney Princesses. Yeah Disney has indeed spoilt us silly! Days preceding the wedding, brides tend to get more anxious about every little detail surrounding their wedding planning. Will the decorator cut down the price for the jute runners you’ve wanted to set on your table decor? What if the lehenga doesn’t fit? What if the caterers mess up with the food arrangement? What if this, what if that?! The series of “what ifs” could simply slip a bride into an anxiety or panic attack. To avoid from getting overwhelmed with all such nuances of your wedding its essential you calm your nerves by breathing in – breathing out and believe that everything will be just fine. Begin to visualize your wedding, the way you’ve been planning for it and pinning those gazillion boards on Pinterest. 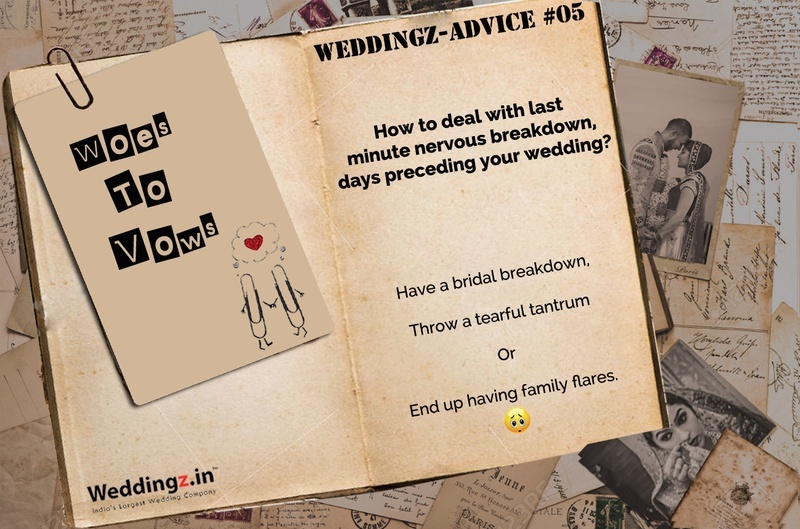 If all these tips as a starter don’t work out, scroll on as we give you some cool suggestions to bust those last minute nervous breakdown moments you may or may not go through days preceding your wedding. Who else to share your wedding worries than the ones who’ve known all your deep dark secrets? Your girlfriends of course or your best guy buddy. Go on a luncheon with your friends or for a relaxing beauty spa treatment with your girlfriend, whatever break it takes to calm those wedding nerves, get right on to it before it gets onto you. By positive we don’t mean the ‘Yes Man’ kind of people, who will simply agree to whatever you say. When you’re already going through a mess, it’s good to have calming and reassuring people around you. Surround yourself with people who keep a positive attitude even in times of crises and provide practical solutions. Take up some light exercising or go brisk walking to drive away your attention from all the madness surrounding your wedding planning. To calm your nervous breakdown on or before the wedding day simply get up and go brisk walking this should help to lower the anxiety. Days or months preceding your wedding join the gym or do some home exercising to distract your mind and focus more on getting fit to look like a diva on your day. Never skip breakfast. It is the most important meal of the day. Also, DO NOT CRASH DIET, this will just make you crankier and increase the chances of a nervous breakdown. Eat substantial meals. Get at least 7-8 hours of good sleep. If you’re having difficulty sleeping and getting enough rest, indulge in things that relax you like reading a novel, sipping on a cup of tea, lighting fragrant candles or burning aromatherapy oils or simply taking a long and relaxing bath. Keep a planner handy and if you’re managing certain details of your wedding, for example say decoration, ensure last minute details are covered a day or two before the wedding. But, if you are to be too occupied with pre-wedding functions delegate the task to someone responsible, it could be your any of the elder members of your house or catch hold of your cousins. There will be times you may get super worked up and decide to gulp down a whole bottle of your favourite poison on your bachelorette party just to ease the tension. As tempting as it may get, avoid it if you do not want to be a hangover bride. If you feel like taking a quick sip of champagne just before your wedding to drive away those jitters, it’s absolutely okay. A sip or even a glass is fine, but not more. It’s a wedding and just like any other party, this one too will have some last minute blunders. Don’t sweat over those petty issues. Instead relax and enjoy the happy moments that are finally taking place. Once you’ve focussed your radar only your fiancé, suddenly even the fine little décor elements that have been bothering you all this while will get out of focus. It’s your new journey with him and when its finally happening, shower all your attention on him and be amazed at how all this while the things you’ve been fretting on and facing those multiple nervous breakdown over don’t really matter.